Earlier this year, author Allen J. Wiener asked me to read his manuscript on Elvis Presley’s television career, and to provide a cover blurb if I liked the book. I am neither an authority on Elvis nor on television history, but I said, “sure.” I was not only a fan of Elvis’s music, but, as a college disc jockey during the 60s and 70s, I played his music, even when his better songs of the period (e.g., the Jerry Reed penned songs U.S. Male and Guitar Man, 1967-68) missed the Top 40 and were considered particularly unfashionable in psychedelic San Francisco. I found Wiener’s book to be a very remarkable study. The blurb I submitted ran 340 words long because I could not stop gushing. Of course only a relatively few words made it to the cover blurb. I let Allen Wiener edit me down last spring, but, now that the book (Channeling Elvis, Create Space, 2014, $17.95) is available on Amazon, I thought I’d share with you my reaction to the book. For Elvis fans and students of television and this vibrant musical period, Channeling Elvis is a must. Even though Presley too often allowed others to control or shape his destiny, the Elvises that emerge in Wiener’s account always command the spotlight. From the young, explosive force of nature, whose utter decency disarmed some (not all) of his fiercest critics, to the fully engaged and energized comeback artist whose televised brilliance made his rockabilly glory unexpectedly relevant in the psychedelic era, and on to the prematurely aging, drug-and-booze-addled performer of the late 70s, no longer caring to create, content to be a demigod among his adoring fans, Elvis was, from first to last, “must-see TV.” Wiener mines the usual published sources, but the gold is found in his revealing interviews with those who worked on camera and behind the scenes with Presley to create his various TV appearances. So, I’m neither a completist, nor a 1st edition or author signature chaser, but at the recent Wild West History Association meeting in Golden CO (the “Denver Roundup”), I was attracted by the books. I broke down and bought a first edition Stuart Lake; the real first edition, the one with the misspellings on pages 25 and 54. I bid on first edition no-DJ hardbacks of Ed Bartholomew’s two volume bio of Wyatt, but backed out and was happy to see Nancy Samuelson get these. I didn’t even consider what looked like Fine Condition Ed Bartholomew dust jacketed hardback pair for $395. Will stick with my paperbacks. But the experience is prompting me to discuss the current state of collecting first edition books about Wyatt Earp and Tombstone. I will keep it to those works published from the 1920s up until the scholars began to take over, so up to and including Paula Mitchell Marks’s 1989 scholarly popular history, And Die in the West. If you are thinking about getting into the collecting game, these are today’s high prices on abebooks.com. These are not prices the books are selling for, merely offered for. You might find a much different slate of books on Alibris.com or at Amazon.com. Just using abebooks as a point of comparison. Quality is rated as Fine (F), Very Good (VG), and Good (G). I’ve not listed anything that was merely Fair (F), and you don’t want below that. I’ve also noted where author signatures are included. The Earp/Tombstone world signatures do hike the price, but you won’t pay the $20,000 premium for a Winston Churchill signature. Of course, if Churchill signed a copy of I Married Wyatt Earp, I might get a 2nd mortgage for that one! Walter Noble Burns, Tombstone: An Illiad of the Southwest (Doubleday, Page, & Co. 1927). $350 for VG copy in G dust jacket. I found 11 1st editions on abebooks, only 3 with dust jackets. Did not sell as many copies as Burns’ Billy the Kid so harder to find. Seller also offers a G copy with G jacket for $69. @ $220: VG copy in VG Dust Jacket. No mention regarding error on page 54. @ $200: VG copy in VG DJ. Again, no mention regarding whether page 54 error was corrected. @ $225: VG copy. No mention of dust jacket, but what makes this of interest is the presence of a Stuart Lake inscription and signature. A bookseller at WWHA was selling an inscribed 1931 edition no-DJ copy for $250. (The book I would class as VG- or G+). @ $145: Fine copy with near-F DJ. What makes this of interest is that it was only in 1955 that cover artist Nicholas Eggenhoffer revisited his cover painting and added Doc Holliday standing along side the three Earps at the OK Corral. From 1931 on, the cover only had the Earps, no Doc. So if you are a cover completist, you will want both the Doc and Doc-less cover paintings! William M Breakenridge, Helldorado: Bringing Law to the Mesquite (Houghton Mifflin, 1929): $550 for a near Fine copy, near Fine DJ on abebooks today. Pricey! If too steep, a VG+ copy with VG- DJ is only $350. And a Fine copy with no DJ can be had for $150. The books above were all published by New York publishing houses, so the prints ran into tens of thousands of copies, if not more, in first editions. Some of those below were published by small publishers, and so print runs were smaller, and first editions are harder to find. Ed Bartholomew, Wyatt Earp 1848-1880 The Untold Story (Frontier Book Co., 1963): $200 for VG copy in VG DJ and signed by author. You can also get an unsigned Fine copy with Fine DJ for $85! Ed Bartholomew, Wyatt Earp 1879-1882 The Man & The Myth (Frontier Book Co., 1964): $175 for Fine copy with VG DJ. You can also get a Good copy with G DJ and signature for $125. John Myers Myers, Doc Holliday (Little, Brown & Co., 1955), $155 for VG copy in G+ DJ. But wait! Another listing for VG copy and VG DJ for just $125. Remember, I am only listing hard cover books. John Myers Myers, The Last Chance: Tombstone’s Early Years (E. P. Dutton, 1950): $50 for NF copy in NF DJ. The cheapest of the books I’ve listed, but this is the best of the early histories of Tombstone. I’d read Burns and Lake in my early teens, but drifted away until I bought a copy of The Last Chance at Gilchrease’s Wyatt Earp Museum in Tombstone in 1971. Reading and rereading this one kept me tethered while I spent some decades immersed in the French Revolution & Napoleon. Glenn Boyer, I Married Wyatt Earp: The Recollections of Josephine Sarah Marcus Earp (Univ of AZ Press, 1976): $225 for Fine copy with Fine DJ of this fine hoax. Al Turner, The O.K. Corral Inquest (Early West, 1981): $150 for “As New” copy in “As New” DJ. Other listings include F copy in F DJ for $111, and NF copy in NF DJ for just $45. Paula Mitchell Marks, And Die in the West: The Story of the O.K. Corral Gunfight (Morrow, 1989): $150 for “as new” copy in “as new” DJ. Listed as first printing of first edition. Other listings include $125 for signed first edition, Fine copy in DJ (quality of DJ not mentioned); and $117 for first printing of Fine- copy in Fine DJ. Churchill, The History of the English Speaking Peoples (hereinafter HESP), (my copy is the American edition, Dodd, Mead, & Co., 1962 reprint; first published 1956-1958). Volumes I-IV: The Birth of Britain; The New World; The Age of Revolutions; The Great Democracies. 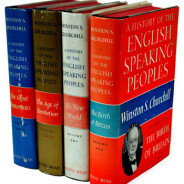 The four-volume History of the English-Speaking Peoples, begun by Churchill before the Secord World War, is the last book he completed and published. It’s a highly personal view of British and American history (with very little on the English speaking nations of Canada, Australia, New Zealand, and even next-door Ireland. As for Indians, Africans, and other non-white colonials, for Churchill they are merely the beneficiaries of British imperial rule.). Largely written in the late 1930s, it was left unfinished when the war erupted. He returned to it after his second prime ministry ended in 1955. By that time, Churchill was in his early 80s and in ill health. As with his memoir, The Second World War (TSSW), a committee of accomplished historians and researchers helped him to finish the book. Churchill’s histories, as critics have long pointed out, were largely limited in scope to brilliant and mediocre statesmen and generals in conflict. Or, as Clement Atlee famously joked about the author and his books, “Things in history that interested me.” In the case of HESP, Churchill puts the spotlight on kings, barons, generals, parliamentarians, other “Great Men” (and a few women, e.g., Boudicca, Joan of Arc, Queen Elizabeth), and not a few poltroons. By pushing against one another for power, forever scheming and negotiating, when not sword-thrusting and axe-chopping, Churchill’s parade of characters advanced and backpedaled their usually self-centered way toward liberty. In the process, they transformed England from ancient Rome’s 43rd province to the far-flung empire that, by 1900, turned most world maps half-pink, and, on the west side of the Atlantic, their cousins created and ensured the survival of the United States. Politics and battles fill HESP’s sixteen hundred pages, as Churchill describes an unsteady, uncertain, and, even to the author, questionable march of progress toward the rule of law among the English-speaking peoples. Englishmen (and their Welsh and Scottish cousins) and Americans stand, at the book’s end, poised as mankind’s best hope that Western civilization will survive. Society, science, economics, literature, art, and the lives of “the little people” made few demands on Churchill’s pen, except insofar as they contributed to his preferred story line. Fortunately, the upper crusty Churchill’s narrow idea of history was exactly what I was looking for in my youth. Along with The Second World War, HESP stands as Churchill’s biggest selling book. Because of the author’s Victorian mindset, his narrow focus on politics and war, on the impact of great men, to the exclusion of economic and social forces, as well as his uncritical view of the British Empire as a nearly unalloyed force for good in the world, among other flaws and features, this is neither a great nor reliable history. And yet, because of the power of Churchill’s language, archaic-yet-accessible, utterly charmingly conversational in tone, unflaggingly witty, and yet never flinching from ugliness, it is one of the most engaging histories one is likely to read. It is, like virtually all of his books, first and foremost a human drama. I can think of no book likelier to launch readers on a hunt for more books on everyone from Julius Caesar to Queen Victoria. Beyond that, the author, more than any historian since Caesar, brought to the written page an up-close-and-personal grasp of politics, statesmanship, and war. In Churchill’s case, this was acquired during several military campaigns as a young officer and combat journalist, as a battalion commander in the First World War trenches, and as a hard-charging, often brilliant, and often wrong-headed cabinet minister, back-bencher, and sometime political pariah. Few histories are as insightful about how people in power behave. 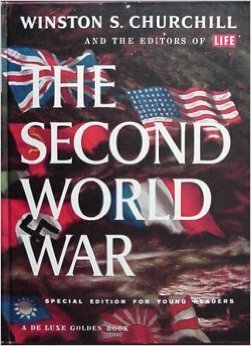 Finally, Churchill, writing the manuscript on the eve of the Second World War, was able to express in the History of the English-Speaking Peoples just why his countrymen would never surrender to the monstrous Nazi dictatorship when the war he predicted finally came. The very act of writing this book, along with Churchill’s earlier Marlborough: His Life and Times, was an educational and character-steadying process that readied Churchill for his nation’s and his own “finest hour.” This alone makes HESP valuable as a window into Churchill’s thinking about his country and himself on the eve of the greatest challenge they both faced. How often does any book do that? Ironically, this work of roughly 500,000 words in four volumes is also the book that includes the most writing by Churchill’s collaborators. The book was originally written in the late 1930s, hurriedly so as Churchill increasingly concentrated his attentions on the growing Nazi threat. The resulting manuscript was deemed unsuitable by the publisher, and not until the mid-1950s did he return to it. By that time, he was no longer the writer he once was, and the final draft, much revised, was much less his own work. Still, volumes I and II “are wholly Churchill’s,” though with assistance from his background researchers, as he jumped into the project with no previous expertise on Britain before the 17th century. The first part of Volume III, a distillation of his Marlborough biography, is again Churchill’s, and so is the middle portion of Volume IV, covering the American Civil War. 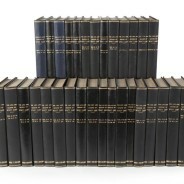 The bulk of volumes III-IV was largely the work of Churchill’s rotating band of hired experts, although they knew what he wanted and his was the final say. I was born with dual U.S. and British citizenship, a reverse, low rent version of the much loftier-born Sir Winston Leonard Spencer-Churchill (1874-1965), the elder son of Lord Randolph Churchill (1849-1895), himself the third son of the seventh Duke of Marlborough, and the husband of American heiress Jeanette Jerome, Lady Randolph Churchill (1854-1921). My mother’s regard for Churchill’s leadership during the dark hours when Britain and the Empire fought alone (while America waited for Pearl Harbor to get in) was very high. In 1965, she insisted that I watch Churchill’s state funeral on TV, a non-royal event of a magnitude not seen since the funerals of Nelson and Wellington, reflecting his brief but dramatic career in Victoria’s army, his two tours as the United Kingdom’s First Lord of the Admiralty during both World Wars, and his Western civilization-saving Prime Ministry during the Second World War. By that time, I already owned two Churchill-written volumes. Churchill wrote 43 book-length works, in 72 volumes. One might divide them into six categories: (1) autobiographies; (2) memoirs, with selected documents, of the two world wars; (3) collected speeches; (4) biographies; and (5) and a history of Britain and America. I’d read only a few of his books before I turned away in my 20s from eclectic reading to focused writing. In recent months, I became reacquainted with Winnie. Unless I choose to drop everything else in life, I do not have the years to read his multi-volume war memoirs, or the 3-volume Manchester-Reid biography, or the immense official biography. Instead, I’ve chosen to re-visit old friends on the shelf, and to concentrate on specialized biographies of Churchill by others addressing stages of his life that I know little about, for example his early parliamentary career. Most of all, I am interested in his and work as a writer: his purposes in writing, sources of inspiration, research methods, writing style, influence on other historians, and his amazing ability to negotiate contracts he never adhered to, for royalty advances he often failed to earn back. More information on the Churchill books in my library in Part 2. Been reading up on the Johnson County Invasion of 1892. In “Freedom Around the Corner,” a survey history of America from 1585-1828, historian Walter McDougall addresses the American gift for hustling, a trait shared by those who hustle in the sense of working hard, for themselves, their families, and in shared community endeavors, and those who hustle others, deceitfully, fraudulently, and aggressively for their own gain. The latter, in unsavory, illegal, even unconstitutional form, was practiced by 1880s-1890s Wyoming capitalist ranchers, Social Darwinists who felt they deserved it all, against the smaller settlers in Johnson and nearby counties. * Asa Shinn Mercer, Banditti of the Plains, 1894 (suppressed), reprinted 1954, 1975. Mercer was initially the press voice of the big cattlemen. The invasion turned him against them. His book was so inflammatory from big cattle’s viewpoint that they seized nearly all 1st edition copies and, it appears, all 2nd edition copies. Some copies escaped, and the book has been widely available since 1954. * Helena Huntington Smith, The War on Powder River (1967): the first subsequent comprehensive account. The standard work until recently. * George W. Hufsmith, The Wyoming Lynching of Cattle Kate, 1889 (1993): an account of the cattlemen just getting started against their perceived adversaries. * Bill O’Neal, The Johnson County War (2004): Well researched and highly entertaining version of events by prolific Western historian. * Marilynn S. Johnson, Violence in the West: The Johnson County Range War and Ludlow Massacre: A Brief History with Documents (2008), a small (192-page) summary with primary documents of two Western confrontations between capital and smaller operators and unions. 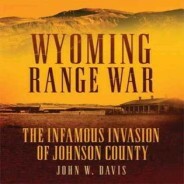 John W. Davis, Wyoming Range War (Univ. of Oklahoma Press, 2006, reprinted 2012), establishes through largely untapped Johnson County sources that the county was never a rustler haven. Its rich land was a magnet for small ranchers who were stymied by the big cattlemen in their every legitimate attempt to build small herds on homesteaded public land. In reality, the invasion by Wyoming’s biggest cattlemen and their Texas mercenaries was launched to drive out settlers out of their legal homesteads and to cover up previous assassinations and a botched attempt on Nate Champion and others. Davis mines overlooked sources to reveal how big cattlemen, egged on by two of their number with Hardin-like sociopathic tendencies, assisted by murderer-turned-lawless lawman Frank Canton, aided by a pocketed state government and paid-for press, aimed to quickly murder 70 settlers and local leaders, intimidating other settlers to clear out. They largely failed in this end, but in their later successful perversion of the courts, did selfishly endanger Wyoming’s reputation and future. The best book on Gilded Age greed gone Wild West. I regularly read Old West discussion forums. The most active such website may be the “Tombstone History Discussion Forum,” filled with lively arguments over the Gunfight at the O.K. Corral, the iconic Wyatt Earp, Tombstone (“the town too tough to die”), and all things related. The opinions of forum posters do appear to shift on occasion, but mostly participants seem to talk past one another, their historical and evidentiary arguments on any side of the controversies du jour making little apparent headway in the face of strong, preconceived ideas. I thought a lot about the concrete stances taken on a fluid river of historical knowledge as I recently read an engaging book on what it is historians actually do and whether or not writing history is more of a scientific or artistic endeavor. In The Landscape of History: How Historians Map the Past (Oxford Univ. Press, 2002), John Lewis Gaddis presents a multitude of useful metaphors to explain what historians do and the age-old question of whether history has more in common with science or art. As the title and subtitle suggest, history is a lot like cartography. Historians, like map makers, “represent realities they can’t replicate and wouldn’t want to: a truly accurate map of Oxford would be an exact clone of Oxford…. Maps vary scale and content according to need.” Historians, too, must choose what to include, and at what levels—varying the scales of time and space according to the historian’s and the audience’s needs. Any account of Pearl Harbor (or the O.K. Corral, for that matter), probably does not need to inform the reader what Yamamoto (or Wyatt Earp, etc.) ate for breakfast a week earlier, or even that morning. “The answer is, of course, that they don’t. Because not all sources survive, because not everything gets recorded in the sources in the first place, because the memories of participants can be unreliable, and because even if they were reliable no participant could have witnessed all of an event from all possible angles, we can never expect to get the full story of what actually happened.” We can get closer to the truth, but the historian’s basis for determining causes is “always provisional…. Historians do the best they can, therefore, but our findings are subject to revision, just as they would be in any other field of human inquiry.” Historians are left with a representation they hope closely fits the reality they seek to explain. This representation is usually in the form of a narrative which simulates in thought what happened in the past. Gaddis has much more to say about history and biography in this breezily written and easily understood book. Recommended for historians and readers of history alike. REVISED FRIDAY MAY 9, 2014: A poster on BJ’s Tombstone History Discussion Website (http://disc.yourwebapps.com/Indices/39627.html ) asked for recommendations of the ten best books on Tombstone and Wyatt Earp and Tombstone and also a list of books to avoid. My list of essential books is up to 24, including 4 illustrated books to introduce the unsuspecting to this field. I’d avoid only one book, the late Glenn Boyer’s The Earp Curse. One feels the need for a shower after reading its execrable attacks on anyone who disagreed with his take on the Earp story and his use of hoaxes to tell that story. Plenty of other books have been debunked as questionable history or biography, but I would not avoid them. Earp has a legendary status that has risen and fallen, and the debunked books are a key part of that story. With that in mind, I’ll leap into the fray of what’s essential reading, even if to be used with caution. My own collection is boxed for a planned move, so I may have missed something. Stuart Lake: Wyatt Earp, Frontier Marshal (1931): Deeply researched, but much of the evidence was selected in or out and slanted to create a superhuman lawman. One of the most influential biographies of the 20th century. Catapulted Earp to an American icon. Virtually every book on Earp or featuring him, and of course every Hollywood portrayal, as well as the creation of countless fictional characters and stories, have been in reaction to the image Lake created in this book. As for Lake himself, at the April 2014 Arizona History Conference, Anne Collier delivered an eye-opening paper on what made Lake tick and how that translated into his desire/need to turn Earp into the legend he became. Certainly hope she publishes it one day. Michael F. Blake, Hollywood and the O.K. Corral: Portrayals of the Gunfight and Wyatt Earp (2006): Right from the start, the O.K. Corral was the stuff of cinema. Blake’s book nicely fills a gaping hole in the literature on Wyatt Earp’s transition from itinerant lawman, gambler, miner, horse thief, pimp, and con man to the iconic, legendary, and nearly mythical character he is today. The same goes for the evolution of the sudden and shocking street fight in Tombstone to today’s metaphor for any vicious gun battle, firefight, or other spot where bullets seem to be flying from all sides. Blake addresses at length Hollywood’s role in building, debunking, and shape-shifting the legends of both the “Gunfight at the O.K. Corral” and the one participant who remained standing, untouched by lead. Casey Tefertiller, Wyatt Earp: The Life Behind the Legend (1997): After 17 years, still the essential biography. Nothing comes close. Fair minded, acknowledges Earp’s warts. Rightly concentrates on the years in Tombstone. Among other things, still the best book on the involvement of the San Francisco capitalists in the Earp: Cowboy contest. Addresses the important question of what a man is to do to achieve justice when law breaks down. In great need of a second edition following Peoria and other revelations, but the first edition remains the best life. Allen Barra, Inventing Wyatt Earp: His Life and Many Legends (1998): Nearly equal parts interpretive biography and examination of shifting cultural memory. Barra spends considerable space considering the vastly different takes on Earp by his early hagiographers, his debunkers, the people who knew him, and those who have chosen to use him. Could stand a second edition, but Barra has been quite busy with sport icon biographies. Gary L. Roberts, Doc Holliday: The Life and Legend (2007): Far surpasses any earlier Doc biography, and is likely to remain definitive longer than any other book on this list. Dr. Roberts’ challenge was to get inside the head of Wyatt’s nearly-as-famous (and a shade more notorious) friend, a fascinating man who left next to no record of his internal dialogue (other than his Denver interviews and destroyed letters to his cousin). This necessarily meant that nearly all of Doc’s personality and thoughts were filtered through those who knew him, reported on him, and regarded him with decidedly different, strong opinions. Roberts presents and weighs in on the many controversies in both the main text and the many discursive footnotes, which are not to be missed. John Boessenecker, When Law Was in the Holster: The Frontier Life of Bob Paul (2012): Subject and author are well matched. Bob Paul was possibly the steadiest, most honest, most dedicated, and most reliable lawman of the 19th century American West, and John Boessenecker has become the foremost biographer of lawmen and outlaws working today. A thorough, well-written biography of a thrilling life spent on the high seas, amidst the California gold camps, and across the Madrean Sky Islands and Sonoran Desert trails of Arizona Territory. Boessenecker’s use of court case records reveals that, when it came to the 1880 elections, Wyatt was right: Ike Clanton was indeed a sort of chief among the Cowboys. Paul Lee Johnson, The McLaury Brothers in Tombstone: An OK Corral Obituary (2012): Equal to the Paul biography in reliable scholarship. Johnson does not limit himself to the Tombstone years but fleshes out the brothers’ origins in New York State. Intellectually honest, the author sympathizes with the plight of Frank and Tom, but assigns some blame for their too-close association with the rustling element in Pima/Cochise counties. Will McLaury’s not always effective meddling in the court case against the Earps is also addressed at length. Steve Gatto, Curly Bill: Tombstone’s Most Famous Outlaw (2003): A crackerjack assembly of information on every important thing known about Curly Bill at the time of writing and publication, much of which was uncovered first by Gatto, an indefatigable researcher. While I have disagreed with some of Gatto’s most important interpretations, I have warmed up to the book. His claims, including Curly Bill’s under-indictment flight from Arizona to Texas and survival in the years beyond when Wyatt claimed to have killed him at Mescal Springs are reasonable, stated in measured terms without any flights of fancy, and (despite my disagreement based on the same evidence) are arguably right. Ed Bartholomew, Wyatt Earp, The Untold Story 1848-1880, and Wyatt Earp: the Man and the Myth, 1879-1882 (1963-1964): Venomous. A great deal of rambling in tiny print, backed by the possibly worst citation system ever invented by man. Nevertheless, if you have the patience, you will find nuggets of information worth exploring. Glenn G. Boyer, I Married Wyatt Earp: The Recollections of Josephine Sarah Marcus Earp (1976): The University of Arizona Press was taken in by this, as were I and a generation of Tombstone scholars and buffs. Turns out the account of the Tombstone years was largely invented by the author. Boyer’s hoax began to unravel with the 1995 publication of Jeff Morey’s “The Curious Vendetta of Glenn G. Boyer” (NOLA Quarterly, 1994), and the threads came undone with the work of Gary Roberts, Tony Ortega, and others. Their articles can be found at http://www.tombstonehistoryarchives.com/?page_id=80. Paula Mitchell Marks, And Die in the West: The Story of the O.K. Corral Gunfight (1989): Like the Guinn book below, follows the course of the OK Corral story, from the founding of Tombstone to after the Vendetta Ride. More than anyone before her, Marks successfully addressed how complex personal, political, economic, and social forces could lead to lawlessness and violence along that stretch of the U.S.-Mexico border. I do not agree with her even-handed treatment of the opposing sides, but her book profoundly influenced me to attempt a similar comprehensive book on the El Paso Salt War. The author innocently relied heavily on Boyer’s work in her first edition, but this has been toned down considerably in a later edition. A fine introduction to the subject. Alford E. Turner, The OK Corral Inquest (1992): Indispensable to any informed discussion of the Gunfight in the Vacant Lot off Fremont Street. The preliminary hearing transcript is incomplete and may include some deviations from the actual testimony, but until some new book incorporates other sources (i.e., the Nugget and Epitaph testimony accounts), this will have to do. Steven Lubet, Murder in Tombstone: The Forgotten Trial of Wyatt Earp (2006): Nationally recognized trial authority and historic trials author Steven Lubet uses all the available sources to walk readers through the preliminary hearing that followed the gunfight. His assessments of the prosecution and defense are on a level of detail and with a level of legal understanding found in no other book. Agree or disagree with his interpretation and surprising conclusions, you will have to agree that the book was long overdue. William Breakenridge, Helldorado: Bringing the Law to the Mesquite (1928): Perhaps the most important published reminiscence. As one of Sheriff Johnny Behan’s Cochise County Deputy Sheriffs, Billy Breakenridge got to know the so-called Arizona Cowboys, the rustlers and rancher allies who operated out of the San Simon, Sulphur Spring, and San Pedro Valleys, as well as in the towns of Galeyville, Charleston, and sometimes Tombstone. He worked amiably with them when he had to, and admitted to their criminal and shady doings. Some of his own activities are a bit puffed up and his memories are a bit impaired by the passage of time. Expressed a good opinion of Behan. As for the Earps, not so much. Lynn R. Bailey, The Unwashed Crowd: Stockmen and Ranches of the San Simon and Sulphur Spring Valleys, 1878-1900 (2014): The newest book on the list presents, for the first time, the remarkable New Mexico capitalist and entrepreneurial origins of the Arizona Cowboys. Also includes other revelations, among them the site of the Sarampion, location of the massacre of the Mexican trade train in July 1881. Calls Wyatt Earp’s claim of killing Curly Bill at Mescal Springs “preposterous.” Presents evidence attributing the end of the Cowboys reign of terror to factors other than the Vendetta Ride, most especially to the rise of corporate ranching in the valleys. NOTE: Gary Roberts Doc Holliday bio (above) makes best use of the U.S. Customs Service files addressing Cowboy smuggling of Mexican cattle. William B. Shillingberg, Tombstone, A.T.: A History of Early Mining, Milling, and Mayhem (1999): A great deal of information on the town’s rise and decline. Author concentrates on mining and milling, but can’t avoid the mayhem. The best account of Wyatt Earp’s service as a Deputy Sheriff for Pima County. Lynn R. Bailey, Too Tough to Die: The Rise, Fall, and Resurrection of a Silver Camp, 1878-1990 (2010): The preeminent historian of southeast territorial Arizona’s mining and ranching history brings his expertise to the study of the greatest silver mining town of them all. Unlike Shillingberg, Bailey brings the town’s history down to late 20th century, including its up and down fortunes as a tourist mecca from the first Helldorado celebration through the heyday of Gunfight at the OK Corral portrayals by Hollywood. Bailey has no use for the lionized Wyatt Earp. Artist and True West Magazine publisher Bob Boze Bell, assisted by a number of scholarly contributors, has created a trio of the most attractive and best introductory volumes on the subject. Perfect gifts, perfect eye candy by one of my two favorite Western artists, and perfect light reading, packed with facts and plenty of humor. Get all three: The Illustrated Life and Times of Wyatt Earp (4th edition, 2000); The Illustrated Times of Doc Holliday (2d edition, 1995); and Classic Gunfights, Vol. 2, Blaze Away (2005). 25 gunfights leading up to and away from the OK Corral. “Sadly, historical writing has quite a bad reputation. Newspaper reviewers will often praise a history book because it’s not like a history book. They will say it’s ‘as good as fiction’ and thus ‘a pleasure to read.’….” Ann Curthoys and Ann McGrath, How to Write History That People Want to Read (Palgrave MacMillan, NY, 2011 edition), p.2. The number of “how to” books directed at the Ph.D. who desires to turn a doctoral thesis into a book suggests that many have gotten all the way through graduate school by writing only for their academic mentors. While university English departments offer courses in creative or literary nonfiction, some history students seem to have passed by these. The ability to structure and tell a true story well enough to hold a general audience’s attention to the book’s end too often takes second place to convincing the author’s professorial peers of the most arcane points in one’s argument. Although I’ve had one history published by an academic press, I’d be the first to say that my writing, and my ability to hold the reader, can always stand improvement. Among the books that attempt to bridge the gap between the historian—academic or otherwise—who knows how to research a topic and the reader who wants a page-turning narrative to read, I’d recommend one I recently read by two Australian historians, Ann Curthoys and Ann McGrath, the authors quoted above. The book is written as a primer for wannabe or still-learning published historians covering both historiography and the narrative art. The first chapters are fairly basic. They address such subjects as choosing a historical topic, identifying your target audience, knowing the archival, oral, and other sources, etc. The next chapters, providing writing advice (including narrative, plot, scenes, character, emotion, etc.). These were particularly useful to me. The Amazon “Look Inside” feature includes the full table of contents: http://www.amazon.com/Write-History-that-People-Want/dp/0230290388/ref=sr_1_1?s=books&ie=UTF8&qid=1399411172&sr=1-1&keywords=how+to+write+history+that+people+want+to+read . Another helpful book is Stephen J. Pyne’s Voice & Vision: A Guide to Writing History and Other Serious Nonfiction (Harvard U. Press, 2009). More on that in the future. Thinking Like Your Editor: How to Write Great Serious Nonfiction and Get It Published, by Susan Rabiner and Alfred Fortunato (2002). The Elements of Narrative Nonfiction: How to Write and Sell the Novel of True Events, by Peter Rubie (2006). I would still put these two at the top of my useful volumes list. Still, both could stand an update in light of the advent and increasing acceptance of digital self-publishing, with its too-easy lure of putting books into print without benefit of any real peer review or honest self-checking. A different kind of book about writing history that I recently finished, Landscapes of History, will be the subject of my next post.